Even though it's been 25 years, we want to keep on making new music because it's our life, it's who we are. It has been twenty-five years since the Gipsy Kings captured the world's imagination with their self-titled debut album—a record that became a genuine phenomenon, certified gold and platinum around the globe, introducing millions of listeners to a unique, irresistible blend of traditional flamenco styles with Western pop and Latin rhythms. Since then, the band has toured virtually non-stop, to the farthest-flung corners of the planet, and sold almost twenty million albums, all the while retaining the same line-up of virtuoso musicians. 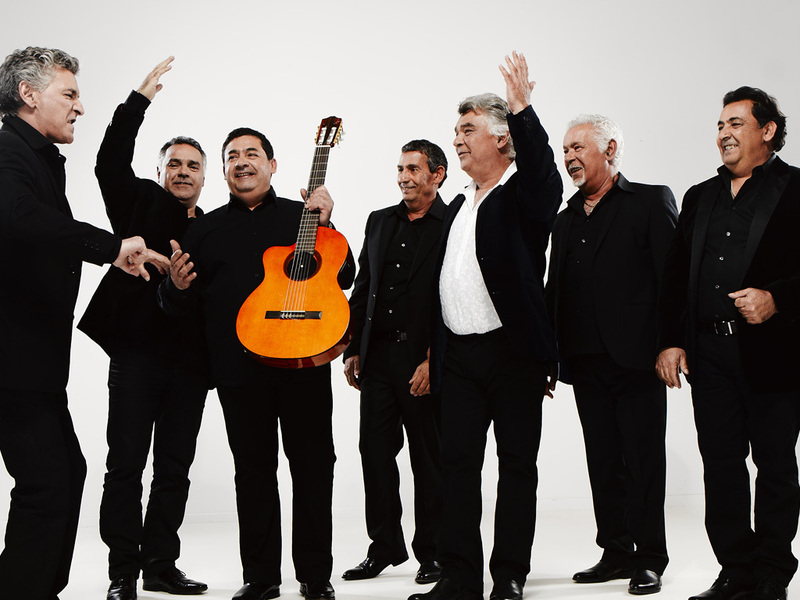 Now the Gipsy Kings return with SAVOR FLAMENCO, their ninth studio album and first new release in six years. The project marks the first time in their storied career that the Kings have produced themselves and written all of the material. It also starts a relationship between France's most successful musical group of all time and a new label, Knitting Factory Records. "Music has always been a passion," says lead guitarist Tonino Baliardo. "Even after all this time, after all these years of touring and working. It has given us so much. We have matured, we have developed in music, and it has been so good for us." Twenty-five years is an eternity in pop music, but the story of the Gipsy Kings reaches back much farther. Theirs is a music that extends through generations, to the sounds of their ancestors, and reflects the eclectic and peripatetic history of the gitanos, Spanish Romani people who fled the Catalonia region during the Spanish Civil War. The group's unchanging roster consists of two bands of brothers—the Reyes (Nicolas, Canut, Paul, Patchai, and Andre) and the Baliardos (Tonino, Paco, and Diego). The fathers of these brothers, Jose Reyes and Manitas de Plata, formed a celebrated flamenco duo which counted the likes of Miles Davis and Pablo Picasso among its fans. When the pair parted ways, Reyes became even more popular after starting his own band, backed up by his sons and called Los Reyes. When the senior Reyes passed away in 1979, Nicolas and Andre began playing with the Baliardo brothers in the Southern French town of Arles. They traveled throughout the country, busking on the streets of Cannes, playing wherever they could—weddings, parties, festivals. Having adopted the perpetual motion of the gypsy lifestyle, they eventually translated "Los Reyes" and changed their name to the Gipsy Kings. "World Music" is often a meaningless catch-all phrase, a marketing shortcut, but as one of the acts that first helped define the phrase, the Gipsy Kings create music that really does cross all borders. From the beginning all the way through SAVOR FLAMENCO, their sound has reflected the constant travel and diverse influences of the gypsy heritage. Their 1987 debut album, which spent forty weeks on the US album charts, introduced the world to "Rumba Gitano"—South America’s rumba rhythm married to the fleet attack of flamenco guitars. That record's "Bamboleo" became a huge, break-out worldwide hit (more than twenty years later, it even turned up on an episode of the TV series Glee). Over the years, the music of the Kings incorporated elements of Latin and Cuban styles, Arabic music, reggae, and jazz guitar reminiscent of the French Gypsy master Django Reinhardt. Yet, as heard on the new album, they have never lost their intense connection to the traditional flamenco of their heritage, keeping a spotlight on Tonino Baliardo's fluid guitar work and Nicolas Reyes's powerful vocals. This broad cultural mix has enabled the Gipsy Kings to be embraced wherever they play—from China to Brazil, New Orleans to Russia, Australia to Africa. The band's music has also remained visible over the years throughout popular culture. They recently performed their version of "Volare," which was an international hit in 1989, on an episode of Dancing with the Stars. Their rendition of "Hotel California" was included in the film The Big Lebowski and on the HBO series Entourage. The 2010 film Toy Story 3 featured a Gipsy Kings version of the movie's popular, Randy Newman-penned theme, "You've Got a Friend in Me." Following the release of their last album, 2006's Pasajero, the Kings looked at the chaos that was dominating the 21st Century music industry and opted to take a break from recording. They never stopped writing new material and developing songs on the road, though; they began recording SAVOR FLAMENCO two years ago, feeling free to write their own arrangements, select the additional musicians they wanted, and produce their own tracks for the first time ever. When it was time to re-enter the marketplace, they also found an innovative new partner in Knitting Factory Records, an independent label which recently oversaw an ambitious campaign to reinvigorate the catalogue of Nigerian musical/political icon Fela. For the band, the new album represents both a look forward and a look back. Nicolas Reyes says of "Samba Samba," the lead single of SAVOR FLAMENCO, that "it's a song very much from our early years—it was written for parties, sun, joy, and beaches." Yet Patchai Reyes also points out the new directions taken in this collection. "There are some Brazilian songs on new album, a mix of cultures," he says. "It's beautiful. We are delighted." The Gipsy Kings have spent a remarkable two-and-a-half decades at the top, in a category that's all their own. Yet in those occasional periods when they aren't touring, the band members still live with their families in the south of France, the area that defined their identities and their sound. Each time, they return to their isolated enclave, and then recreate the experience of immigrants coming to a new land. Certainly, their lives are different from those of their ancestors, but something fundamental still remains; as they continue to travel the world, absorbing new cultures and styles, this mobility, curiosity, and adaptation drives their music ever forward. And as active as this remarkable collective remains, they are also looking to what the longer-term future will hold for the Gipsy Kings—and for the family bonds that define the group. "Even though it's been 25 years, we want to keep on making new music because it's our life, it's who we are," says Nicolas Reyes. "But I think there will be a time when we pass down the Gipsy Kings to our sons." "They will take over what we have started," says Canut Reyes. "This way the legacy will survive."